Los Angeles Jewelry Buyer is a service division of Diamond Estate Jewelry Buyers, which is accredited with the Better Business Bureau. Los Angeles Jewelry Buyer is dedicated to helping its clients obtain all the information they need to make a smart and profitable selling decision. Visit our knowledge corner for expert tips and advice. 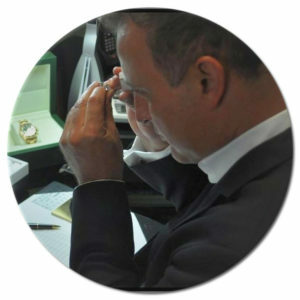 Los Angeles Jewelry Buyer purchases all types of previously-owned fine jewelry, precious gemstones, and valuable timepieces. However, our estate buyers specialize in items manufactured by highly sought-after luxury brands, as well as rare antique items. Some of the more important names that we look for in estate jewelry and fine timepieces are listed below. Fast & Secure. Sell a Diamond Ring in Los Angeles, CA. Los Angeles Jewelry Buyer helps clients throughout Los Angeles County sell their fine jewelry for the cash that they deserve. Our service areas include Los Angeles, Rolling Hills, Westchester, Manhattan Beach, Palos Verdes, Hermosa Beach, El Segundo, Redondo Beach, Marina del Rey, Belmont Shores, Torrance, Bel Air, Beverly Hills, Culver City, Holmby Hills, Hollywood Hills, Brentwood, Santa Monica, Malibu, Coldwater Canyon, Westwood, Beverly Glen, Pasadena, San Marino, Arcadia, Calabasas, Sherman Oaks, Laurel Canyon, Thousand Oaks, and Hidden Hills.